Walking with Jesus: Day 67: Acts 19:21-41 & Prov. 23:1-8 - How Do We Know What We Really Worship? Day 67: Acts 19:21-41 & Prov. 23:1-8 - How Do We Know What We Really Worship? About that time there arose no little disturbance concerning the Way. For a man named Demetrius, a silversmith, who made silver shrines of Artemis, brought no little business to the craftsmen. These he gathered together, with the workmen in similar trades, and said, “Men, you know that from this business we have our wealth. And you see and hear that not only in Ephesus but in almost all of Asia this Paul has persuaded and turned away a great many people, saying that gods made with hands are not gods. And there is danger not only that this trade of ours may come into disrepute . . ."
How Do We Know What We Really Worship? The people of Ephesus worshiped the goddess Artemis. 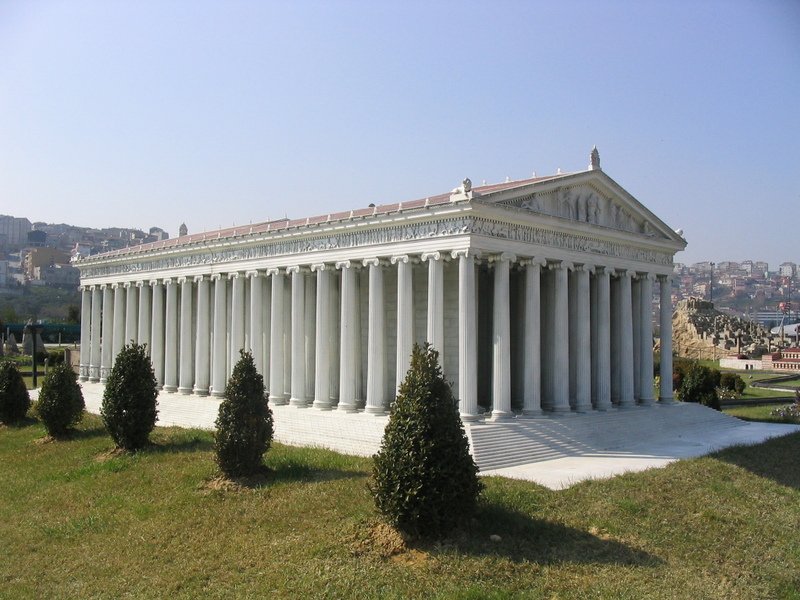 The Temple of Artemis in Ephesus was one of the Seven Wonders of the Ancient World. In antiquity, as in modern times, having a famous landmark generated a lot of tourist traffic. And, where there are tourists, there will be merchants willing to sell things to tourists. One such merchant in Ephesus was Demetrius, a silversmith. He and his fellow silversmiths made silver shrines to the goddess, which "brought no little business to the craftsmen." Demetrius had a problem. The growth of the Gospel in Ephesus was threatening his business, or so he thought. He had probably seen the new believers who had come out of witchcraft burn their spell books worth fifty thousand of pieces of silver. For Demetrius, this act would have been a direct assault on his god. The Ephesians worshiped Artemis. Many were coming to Paul and converting to become worshipers of Jesus. Demetrius? He worshiped money. How do we know what we really worship? We may claim to be worshiping Jesus, but are we? What is worship is that which is most precious to us. How can we tell what that is, for sure? Well, how do we respond when we're threatened with the loss of it? Romeo and Juliet worshiped each other. The very idea of having to live without the other caused each of them to commit suicide. We know Demetrius worshiped money because the threat of losing his profitable trade caused him to incite a riot. We know the people in the mob worshiped Artemis because the thought of her losing her glory and prestige sent them into an uproar (although many of them didn't know why they were there and others were probably worried about a loss of revenue, like Demetrius). The town clerk worshiped order and security, for he worried that the riot would mean the loss of both. All of these are false gods - Artemis, money, order, security - and one of the sure signs of any false god or idol is that we defend it when it is threatened. We come to its rescue. We shield, protect, cover, guard and sacrifice ourselves for it. Do you realize what distinguishes the one true God from all idols? God defends His people. God comes to our rescue. He shields, protects, covers, guards and even sacrifices Himself for us. So how do you know what you really worship? The idols in your life are those things you are most eager and jealous to protect. Religious respectability can be an idol like this. But when we worship God Almighty, He is the one who covers and defends us! Heavenly Father, We thank You that You are the one true God, and that You do not ask us to defend and protect You, but You come to our defense and protection again and again. We praise You! Keep us from idols that enslave. In Jesus' name, Amen. Father, the temptations of the world are all around us. The "delicacies of the king" are enticing to our eyes and our flesh, and we see them and hear their call every day - advertising, covetous desire, false promises, sexual immorality. Lord, whatever looks good and yet does not come from You is a cause for sin and something we must resist or flee. Give us the grace and the gratitude to be content with the abundant goodness You give. In Jesus' name, Amen.